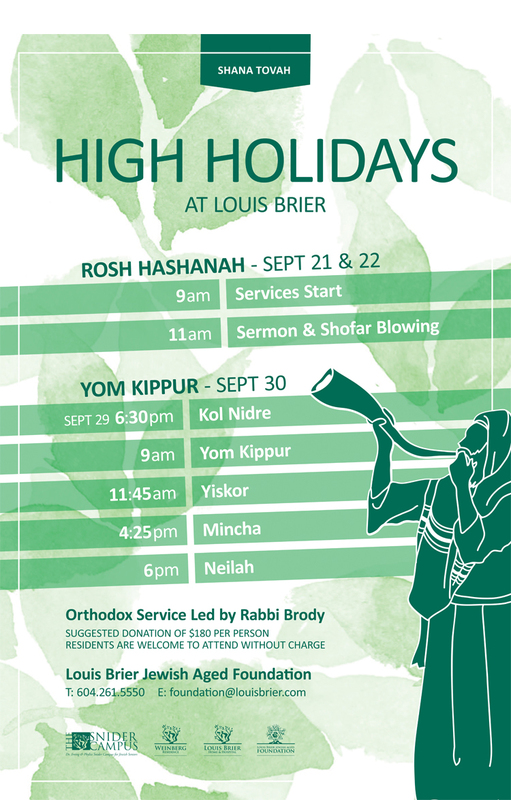 We welcome you to join us for the High Holidays at the Louis Brier. Orthodox service led by Rabbi Brody. Rosh Hashanah on September 21 & 22 and Yom Kippur on September 30. See you there! Suggested donation of $180 per person. Residents are welcome to attend without charge. On June 25, 2017, the foundation hosted an appreciation event honouring donors who had new plaques added to the Gallery of Donors, as well as those who advanced to different categories in the Gallery. At the recognition event, our donors, families and friends all joined together and expressed gratitude for everyone’s on-going support. On February 25, 2017, the Louis Brier honoured one of our longest-serving and most dedicated supporters, Chaim Kornfeld. Chaim was celebrated for his commitment to both the Louis Brier Home & Hospital and the Louis Brier Jewish Aged Foundation, and particularly for his dedicated service to the synagogue for over 40 years. Chaim is revered for his long-standing contributions to the Louis Brier and to the broader Vancouver Jewish community. He is the exemplar of a mentor, achiever and community leader.